A treat anytime of the year. 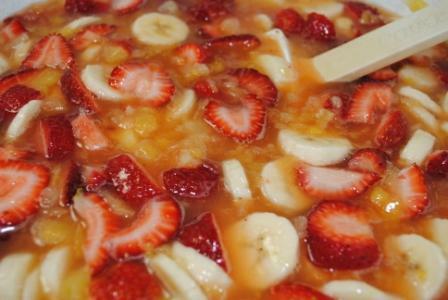 I love fruit and this recipe pleases anytime of the year. It’s great for brunch, dessert, or snack anytime of the day and I think I’m going to go have one right now. Back in the early 70’s we moved to Ft. Madison, Iowa. We were living in Louisville, KY at the time and I remember people telling us we were moving to the “Florida of Iowa” area of the state. How wrong that statement turned out to be. We had 100 days of snow cover one year and if it wasn’t for joining the Welcome Wagon club and church functions I would have gone crazy. When I first heard doctors on TV talk about “cabin fever” I didn’t know what they were taking about. But, when you are huddled in a house with three kids all day trying to stay warm and keep them entertained, then you catch on quickly. (We weren’t really huddled in the house staying room, but it was too cold for the kids to go out and play.) My daughter use to ride her trike in the basement because it was too cold to go outside. We had lots of Easter egg hunts inside because of the weather. 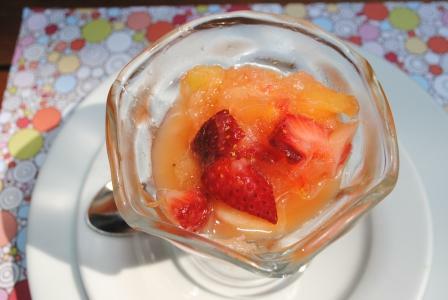 This Frozen Fruit Salad recipe was one that we did at a Welcome Wagon brunch one year. I have never forgotten it. When my kids were younger I use to make this and have in the freezer for snacks. About 15 seconds in the microwave and a few chops, you have a nice slushy snack for anytime of the day. I have always made this in 5 oz. Dixie cups because they are the perfect snack size. Hope you will try this and agree with me that it’s just about the best fruit snack you could make. Looks good like this, but even better frozen and slushy. 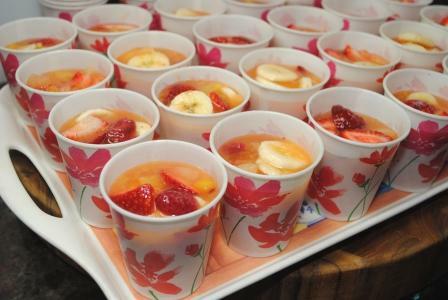 Freeze and then either eat out of the cups or serve in dessert glasses. 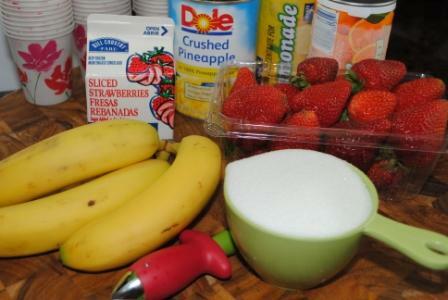 Mix all the above ingredients and stir until the sugar has dissolved. Pour mixture into 5 oz. Dixie cups and put on a tray to freeze until solid. When frozen, I usually put in plastic bags and put into a larger Ziplock bag to store in freezer. When ready to serve, set out about 30 minutes until slightly thawed. Pour into dessert dishes or eat right out of the cup. They can be microwaved for about 15 seconds until slightly thawed. Enjoy! Thank you for posting this recipe. I was looking for recipe I used to make for church brunch. The one I used was very similar to this except mine had a can of apricots. I think I can just add them to this recipe and be very close to the original. You have some great ideas and I appreciate you sharing with us. I would say the recipe makes about 25 or more. I usually keep adding fruit until I like the amount of fruit. I start with basic recipe and probably add maybe another banana or two. Hope this helps. If you make too much, it’s great to have in the freezer for snacks in the summer. I am from Ft. Madison, IA so I am curious to who this is. This is Sherry Michie, We lived in Ft. Madison from 77-81. We lived out on a bluff — Clearview Heights.